The Twelve Tags of Christmas- Funky Junky Style. I just loved this tag with the reindeer and the stars! So I thought I would give it a try! I started by using Blue Sapphire Distress Ink for the background. 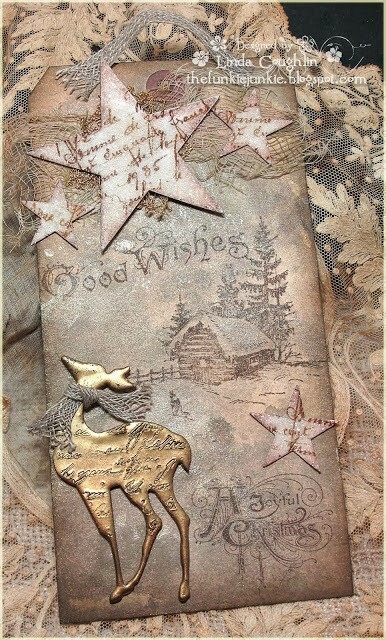 I then added texture with stamps, silver embossed snowflakes, stenciling with fiber paste and some white crackle paint. i was trying to make a nighttime scene, with the snow falling. I do not own the Tim Holtz reindeer, so I had to freehand sketch it on card stock and then fussy cut it out. Then I triple embossed it with silver embossing powder, which I stamped before it dried. I saw this technique mentioned on the Laurart blog (another newly discovered blog) . Isn't it cool??? The stars were also heat embossed in silver and then sprinkled with Rock Candy glitter. The seam binding was white, which I stained with the Blue Sapphire distress ink. I am adding this to my Christmas tag collection! The tags are beautiful. Great job on freehand drawing the reindeer. Wow! This is gorgeous! And incredible reindeer! Absolutely gorgeous tag! Love the colors and the beautiful reindeer! Gorgeous tag Mackie! Love the beautiful metallic reindeer and stars! Hi Mackie, welcome to the 12 Tags of Christmas Funkie Junkie Style! I'm delighted to have you joining. Your tag came out sensational. I absolutely LOVE your blue and silver color palette - the background is exceptional. Great work on that reindeer too. Thanks again for playing along - hope you can do all the 12 tags with me this year - there is still plenty of time and you can combine them with other challenges. Your mixed media prowess amazes me! LOVE this night time scene and you free-handed that reindeer? AMAZING and FABULOUS tag!